This setup makes a friendly baboon pull a switch, Lara can't reach herself. This object can occupy any animating-slot and for further reference, I will call it the 'switch'. 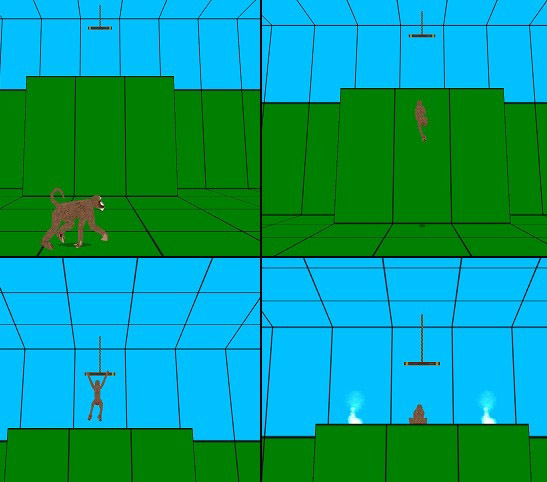 The baboon is made to climb a 9 clicks tall block (that is the height the baboon's animation is made for). The ceiling above the block must be 6-7 clicks. 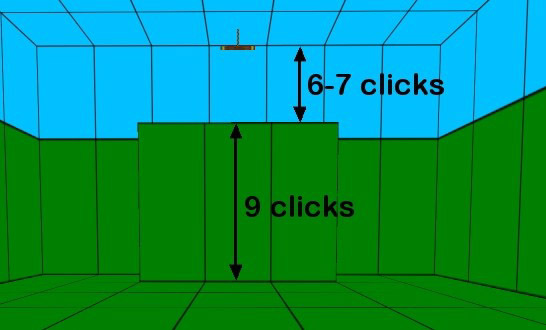 Lower than 6 clicks and the baboon will reach through the ceiling, higher than 7 clicks and the 'switch' will be pulled out of the ceiling. It doesn't matter, if you choose to make it all in one room or use several stacked rooms. And this setup works only when turned east (the default direction for all placed objects) in the editor window (north in game). 1. Place the BABOON_NORMAL and a trigger for it. 2. Place the 'switch'. It's easier to find the correct height for it, if you place it on the ceiling. 3. 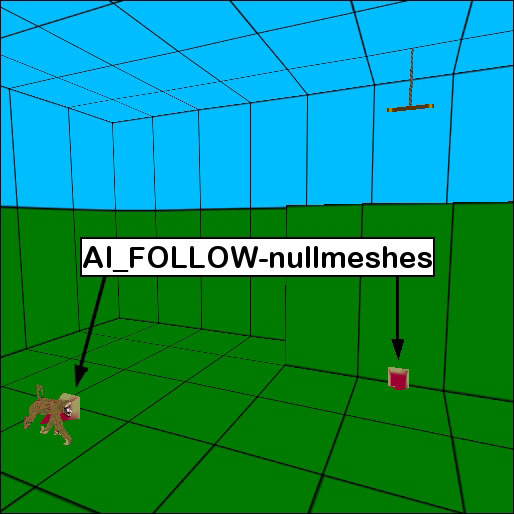 Place two AI_FOLLOW-nullmeshes, one on the same block as the baboon and one on the block in front of the ledge, where the 'switch' is placed. It's of no significance what direction the nullmeshes point in - the baboon knows what it's supposed to do. 4. 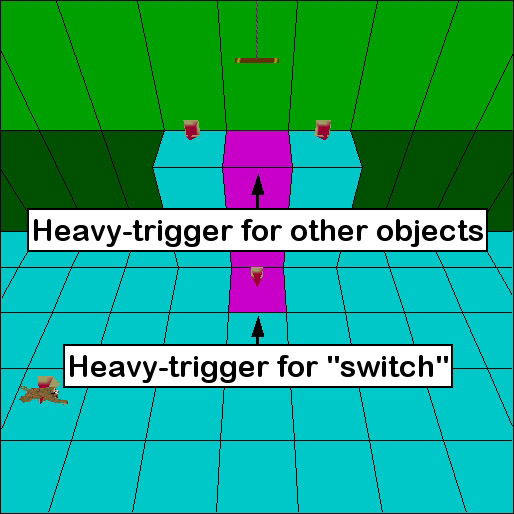 Place a heavy trigger for the 'switch' on the same block as the second AI_FOLLOW-nullmesh. This is necessary, because its animation is timed to fit this setup. 5. All other things you want the baboon to trigger must be placed on the block right below the 'switch'. And you also need to make this (set of) trigger(s) heavy. In the above picture the objects, the baboon is supposed to trigger, are the two FLAME_EMITTER2's on either side of the 'switch'. 6. For the sake of the gameplay you better limit the area, the baboon is able to roam, with boxes (the grey button), because it will roam, and it may easily spend several minutes doing so, which is certain to be a gamekiller. Either the player will think, he/she has encountered a bug, or simply loose patience. In either case he/she will bin your level. Just one minute waiting for the baboon, when there is nothing else to do, feels like a long time. This setup is stable, and you can use more of them in a single level. But make sure the different baboons and their 'switches' are isolated by boxes, because they tend to be distracted by AI_FOLLOW-nullmeshes belonging to other setups (also setups of other kinds) and are very reluctant about returning to their own business. - Once the baboon has pulled its 'switch', it will constantly activate the trigger for the desired object(s). This means, that if you later want to deactivate it (close the door, the baboon opened, or turn out the fire, the baboon lit), the object will re-activate a few moments later (the door opens again, the fire lights again). To prevent this you must use flipeffect 46 (kill all enemies) to get rid of the baboon, before you anti-trigger the object(s), the baboon triggered. 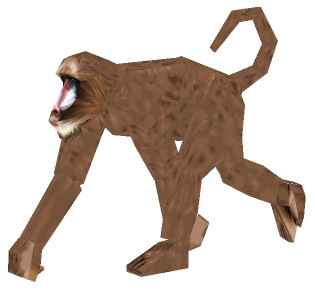 It is the only way to get rid of the baboon, because in most other ways the baboon is considered 'dead' by the game engine (Lara is unable to autoaim at it and doesn't hurt it, when she shoots at it). - Be very careful about how and where you place the triggers for a flipeffect 46. If Lara or another character kills the baboon, it can be revived, if Lara is still able to activate the trigger for it. But if a flipeffect 46 has removed it, nothing can bring it back. So if a flipeffect 46 trigger has been triggered, while the baboon was alive and before it had pulled its assigned 'switch', the setup is effectively ruined and Lara is stuck. - If you have placed a CROWBAR_SWITCH in the same room as a BABOON_NORMAL, it will not work once the baboon has been triggered and as long as it's alive. CROWBAR_SWITCH'es in other rooms will work normally.